How does the Wildhorn Outfitters Seaview 180° full face snorkel mask compare to others? Full face snorkel masks are becoming incredibly popular and for good reason! There are many full face snorkel masks on the market and pricing and quality really does vary between brands. It’s important to know what to look for before you buy. This review will guide you when buying a Seaview 180° full face snorkel mask based on its price, performance and features. If you already know that the Wildhorn Outfitters Seaview 180° Full Face Snorkel Mask is for you, click on the button to see current pricing and any discounts that may apply on Amazon. 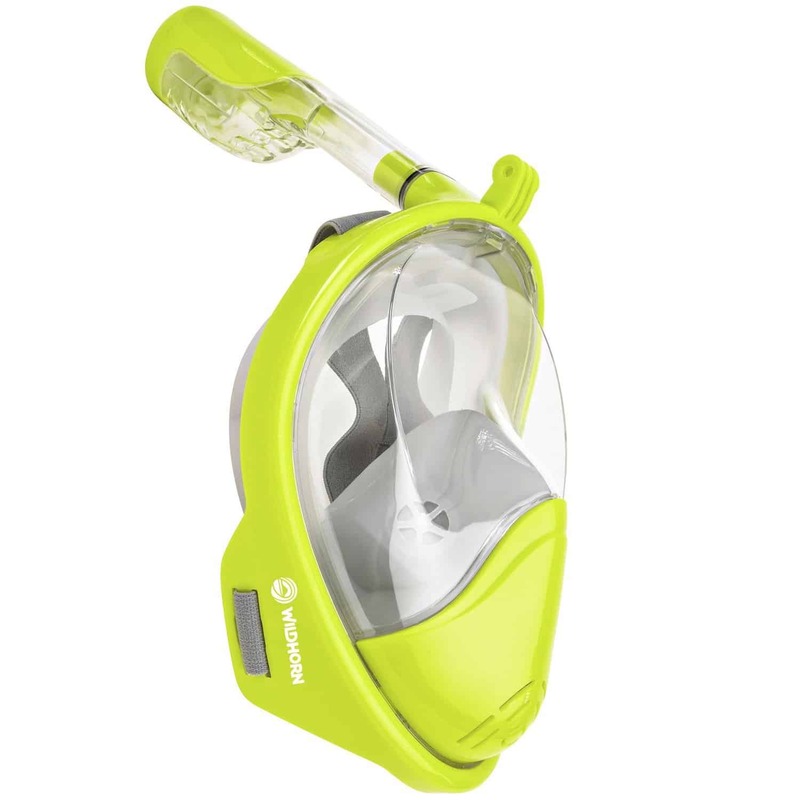 Seaview 180° Full Face Snorkel Mask New colors - BIG savings! 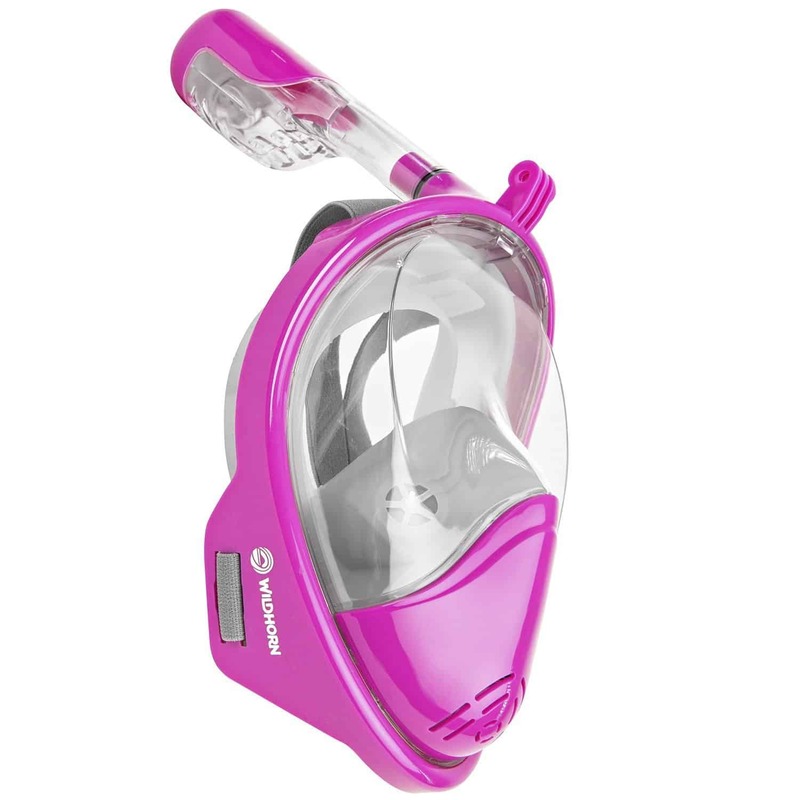 What colors does the Seaview 180° mask come in? Who is this snorkel mask good for? The Verdict - Should you buy the Wildhorn Outfitters SeaView 180° Full Face Snorkel Mask? In the UK or EU? 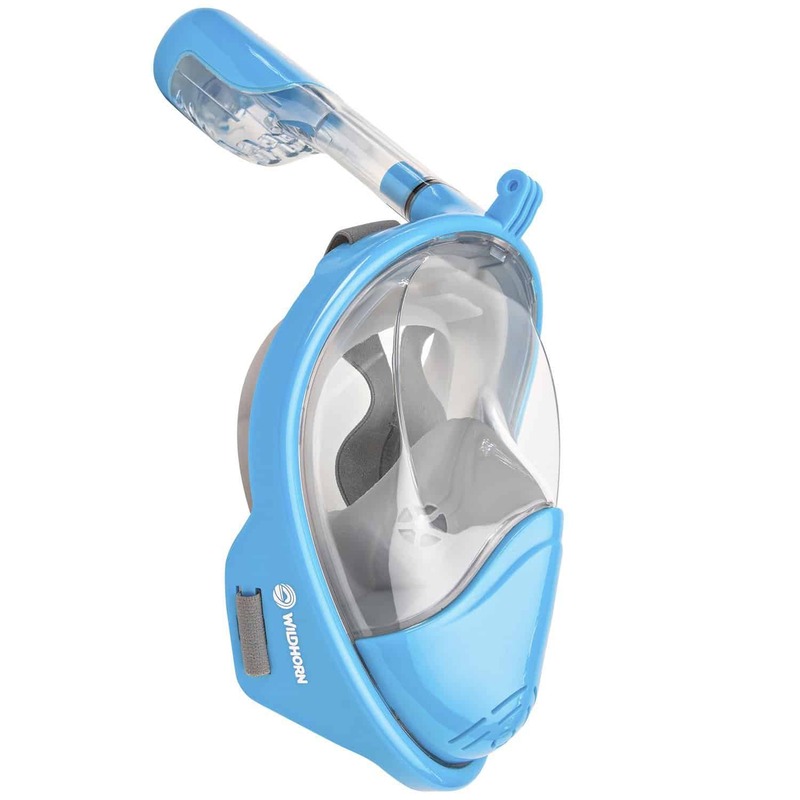 The 3 best quality and most popular full face masks are the Seaview 180° Full Face Snorkel Mask, the Tribord Easybreath, and the Ocean Reef Aria. These are all very good brands, and all are the right up there as the most popular in full face snorkel masks this Summer. Wildhorn Outfitters make the Seaview 180° full face snorkel mask. This is a very good company with outstanding customer service. 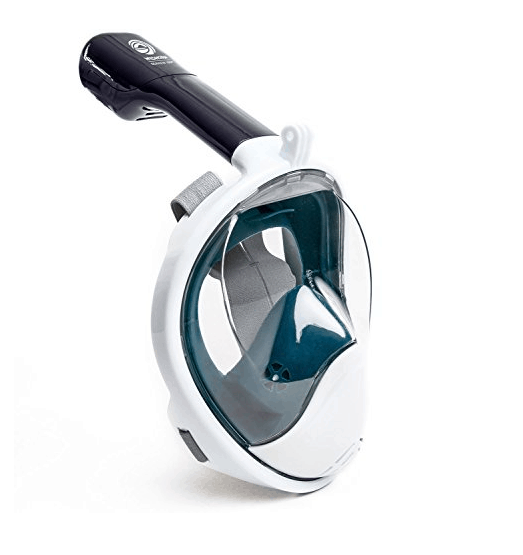 The Seaview 180 is one of the few snorkel masks that comes complete with a camera mount. The built-in camera mount is ideal for taking videos of your underwater adventures. Camera mounts are generally an optional extra accessory with other quality full face masks. There are so many good reasons to love full face snorkel masks. If you like leisurely snorkeling, once you use a full face snorkel mask, you'll never want to go back to a regular mask and mouth piece again. No more gagging - There is no cumbersome mouthpiece with the full face masks and their design makes it easy and natural to breathe through your nose and mouth when submerged. 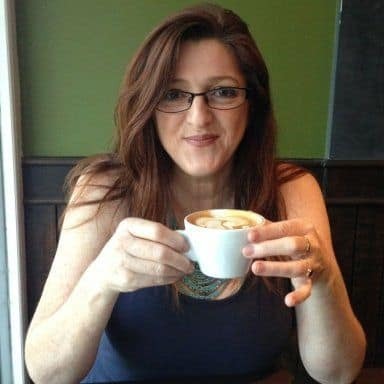 No jaw fatigue - If you're like me and suffer from jaw fatigue, you'll know the feeling after clamping down on a mouthpiece for an hour or so. There is no jaw fatigue even after hours of snorkeling with a full-face snorkel mask. FOGGING is greatly reduced. 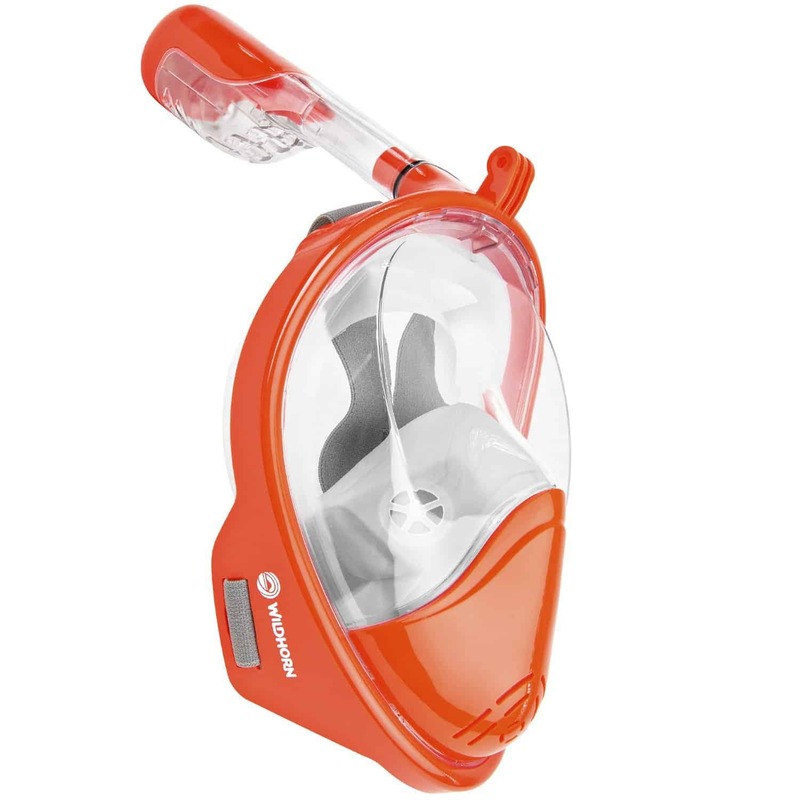 Due to the innovative design of full face snorkel masks, a separate breather chamber has been created away from the main viewing section. 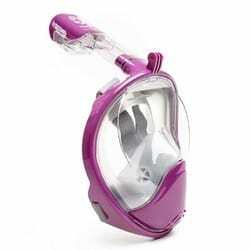 This greatly reduces fogging which will keep you snorkeling longer. The field of vision is unequaled. As stated in the name of the mask, these have a 180° field of vision. The lens is made of a shatterproof polycarbonate. When submerged, water doesn't enter the snorkel thanks to a clever, yet simple float system. The float ball inside the snorkel rises as you go underwater and stops water from entering. If any water does enter the mask, there's a valve in the chin area that allows water to drain away as soon as you lift it above water level. It may look difficult to get the mask on initially, but after a couple of tries, you'll realize it's very easy to put on and adjust. The straps are elastic and won't get caught on your hair. It's very comfortable once in the correct position. The video below shows how easy the SeaView 180 full face snorkel mask is to use. Breathing is easy and snorkeling is a pleasure. Water will not enter the mask even if you try to take a breath while the snorkel is underwater. Wildhorn Outfitters have recently released a big range of new colors PLUS a smaller size for children. These have a lower introductory price. Now is the time to really get a bargain. There are thousands of positive reviews on Amazon, but you'll also see a few complaints about leaking with most full face snorkel masks. The main reason any mask leaks is that it's not the correct size for the person wearing it. The Seaview 180° now comes in 3 sizes, including a XS for children. 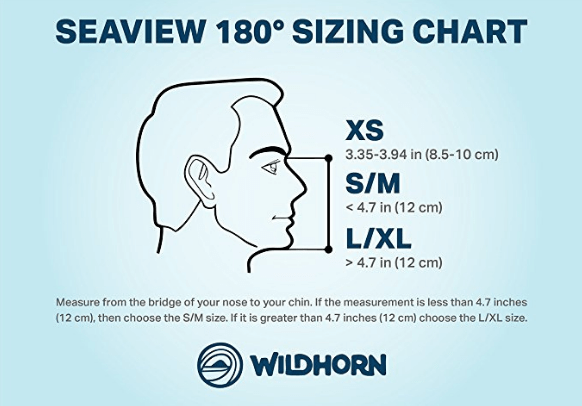 Use the Seaview 180° snorkel mask Sizing Chart below to select the correct size for you. With your mouth closed, get someone to measure the distance between the bridge of your nose and the bottom of your chin. Select Size XS if it measures between 3.35" - 3.94" (between 8.5cm - 10 cm) - This size will fit children (but not really young children). Select Size S/M if it measures greater than 3.94" but less than 4.7" (between 10cm - 12 cm) This size will fit most women and teenagers. It fits slim faces. When you receive your mask, put it on to check that there's no gap between the bottom of the mask and your chin. This is the most common reason for the mask letting in water. These masks are designed for leisurely snorkeling on the surface in relatively calm water. As with traditional style masks, water will enter the snorkel if you lean your head too far forward, as this doesn't allow the float to rise as intended. The float system only works when the snorkel is in a vertical position. Do not buy these if you're thinking you can use it while swimming laps. These are simply not designed for this, and you'll be disappointed with its performance. 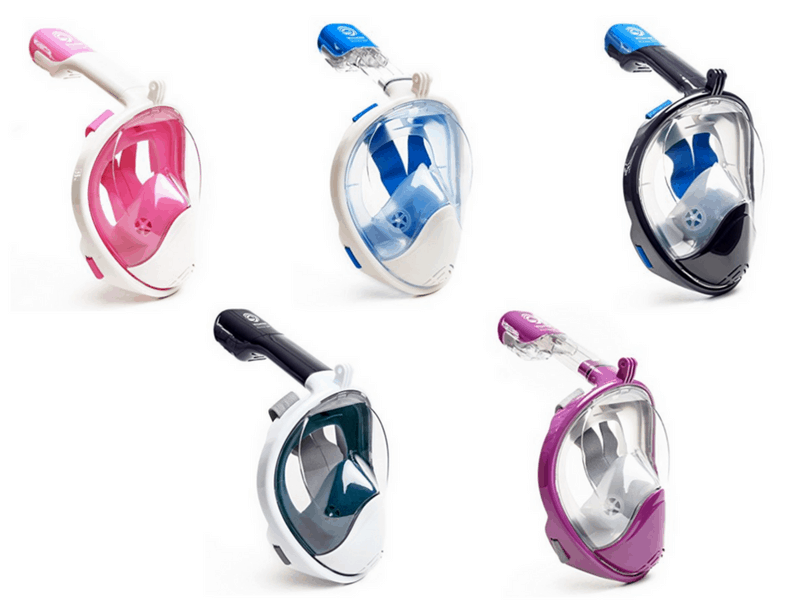 If you're looking for a lap swimming snorkel, have a look at these. These are not designed for Free Diving. 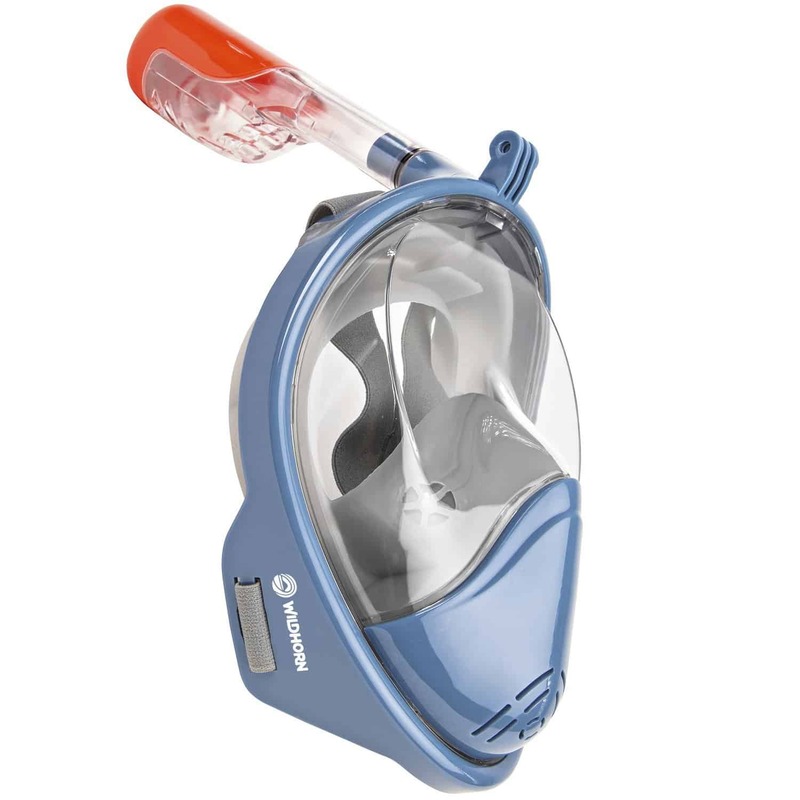 Due to the volume of air inside the face cavity of the mask, it will quickly become uncomfortable below depths of 10 feet. Beards will allow water to enter the mask. This applies to both traditional masks and full face snorkel masks. Beards create tiny spaces that allow water to slowly seep in. Even if it feels like a tight seal, a fringe or long hair trapped between the silicone of the mask and your skin will allow water to get inside the mask. When putting on the mask, make sure you clear long hair completely out of the way. 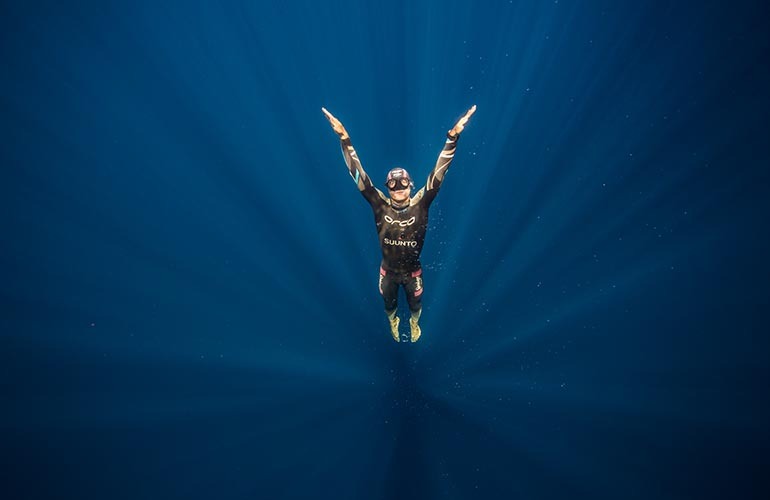 As with all underwater sports, always breath in an even, calm way. When swimming longer distances to get to a new snorkel location, remove the mask. Heavy breathing/exercising is less effective in full face mask designs. Make sure you always rest the snorkel mask visor side up as sand and rough surfaces will scratch the visor. Sand can get into the snorkel area causing the float valve to stick, so always rinse the mask after swimming in salt water. If you do find sand on the mask, don't force the snorkel piece into place. Give it a quick rinse in fresh water before connecting. Don't wash in the dishwasher, as this will damage the mask. A simple rinse in fresh water is all it every needs. Always make sure you rinse the mask after use even if it's only been in a swimming pool. Store the mask in the mesh bag that it came in, and keep it away from sunlight. Until December 2017, these masks were great for adults, teens and older children. Now that there is an XS size, these are also perfect for younger members of the family. These come in a great range of colors. 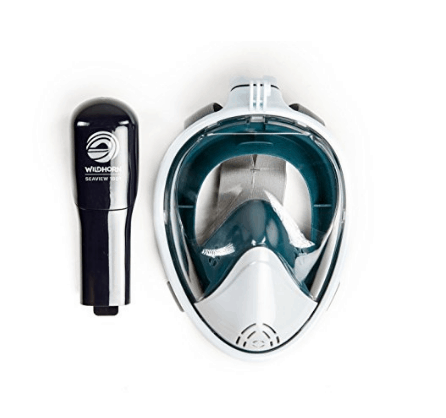 The Wildhorn Outfitters Seaview Snorkel mask also comes complete with a camera mount. This is usually an add-on accessory at extra cost which is handy if you have a GoPro or similar underwater camera. If you enjoy leisurely snorkeling, then absolutely you should! As with all of their products, the Wildhorn Outfitters Seaview 180° full face snorkel mask is well designed and made with quality materials. These comes with a 100% satisfaction guarantee. Customer service is responsive and very quick to help. One of the first brands to incorporate a camera mount into the mold of the mask, so this comes included and not as an accessory. These comes in a big range of colors, and now come in three sizes including an XS size for children. The tip of the snorkel could be a fluorescent yellow or orange color which would make it easier for other water users to see snorkelers in the water. To see the latest price on the Seaview 180° Full-Face Snorkel Mask including any discounts that may apply, click the button below. If you want a quality full face snorkel mask, make sure the one you're purchasing is made by Wildhorn Outfitters. There are a number of full face masks available online that use very similar names but are not of the same quality. Amazon UK don't supply a large range of full face snorkel masks. Most of what is available are the copies from China. The Tribord Subea is available but these are currently only older versions, and don't appear to come in the full range of sizes. Whenever selecting a full face snorkel mask regardless of the brand, go for ones with a flat lens. 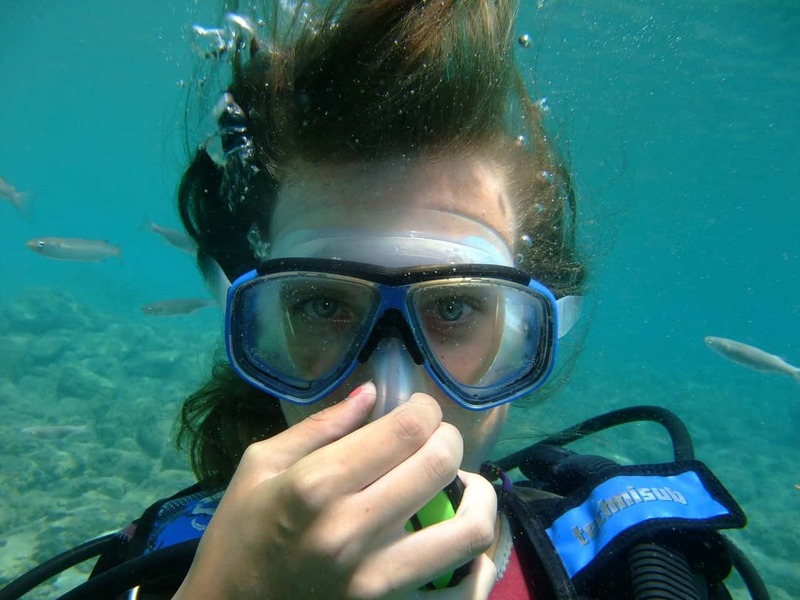 A rounded lens will distort the view underwater and can make people feel dizzy. The biggest problem with the ones made in China is that many are cheap plastic, so the snorkel attachment piece can be difficult to take off once connected, causing it to break. Some of the very low quality masks leak where two pieces of plastic are joined as they're just not quality. For anyone in the UK or EU, I'd recommend the TECKMAX, and the WSTOO. The TECKMAX is good quality but there are reports of fogging. This applies also to the WSTOO. Buying a bottle of Jaws Anti-Fog spray will get around this and you'll still enjoy a great mask. Wild Earth are located on the Gold Coast in Australia will ship Wildhorn Outfitters full face snorkel masks worldwide. Their current stock doesn't include children's sizes but this is a great alternative if you're looking for teen and adult sizes. I bought one for my wife for a cruise in August. She has an upper plate and always found biting down on the mouthpiece of a regular snorkel uncomfortable and painful after awhile. She really likes her full face mask and after decades of snorkeling felt it was the first time she really enjoyed snorkeling. Hi Jason, I’m glad to hear your wife’s enjoying snorkeling again. I found my jaw ached after snorkeling with a traditional mask, but that’s completely eliminated with the full face masks. Pay the money, get the quality. This blog is reviewing Wildhorn Outfitters 180 Seaview mask, and people are buying Chinese crap at half the price called Seaview 180 panoramic with gopro mount. If people buy a cheap mask, they’ll just leak because it’s crappy material. If you want a good quality mask, get this Wildhorn Outfitters 180 Seaview mask. I hadn’t realised that Amazon UK didn’t supply the range of full face snorkel masks until I received your comment. I’ve had a look at what’s available, and most of these are the usual knock-offs from China. There is the Tribord Subea which I would normally recommend but I can only see the older versions of these available. When looking for a full face snorkel mask, you need to find one with a flat screen. Anything with a rounded screen will distort the vision underwater and make people feel dizzy. The biggest problem with the ones made in China is that many are cheap plastic, so the snorkel piece can be difficult to take off once attached, causing cracking. These also sometimes leak from joins where two pieces of plastic come together as they’re just not quality. I’m going to recommend the TECKMAX and the WSTOO. The TECKMAX is good quality but there are reports of fogging. This applies also to the WSTOO. Buying a bottle of Cressi or Jaws brand Anti-Fog spray will get around this and you’ll still enjoy a great mask. I’ve included links to these products above. I hope you find this helpful. I am upgrading our older masks to these new ones. Love the fact that these come with the camera mount when most others don’t. And now with the new kid’s sizes, I am upgrading our older masks to these new ones.